Nike’s marketing pitch: Comfort that keeps kicking. Upper: Single-piece Flyknit mesh with fused layering. Midsole: Full-length React foam, 10 mm heel to toe offset. Outsole: Translucent rubber under the heel and forefoot, exposed React foam. For the most part, Nike’s newest running shoe lives up to the hype. The ride is cushioned, lightweight, and responsive. The Flyknit upper gets most things right. That said, the Epic React could do with some fine-tuning. There had been a veritable drought of innovation in the Nike product line. For far too long, Nike relied on their legacy tech to push their ‘new’ products. But times have changed. Nike Air no longer commands the attention and market share it once did. Lunarlon falls short from a performance standpoint when compared to foam materials like Boost, Everun, or DNA AMP. Flyknit has long ceased to be exclusive; nowadays even $15 running shoes have knit uppers. So the React comes in at an opportune time, building on a product momentum led by the VaporFly and Zoom Fly. The React platform had a soft launch last year in the form of the React Hyperdunk and Jordan Super.Fly, both performance basketball shoes. 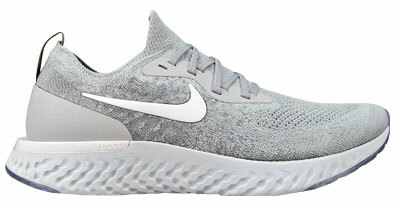 The Epic React Flyknit is the first model to feature the namesake foam in a relatively undiluted, full-length form. The basketball models use React in combination with a thick outsole which makes it difficult to isolate its true cushioning nature. So what is the Nike React, and more importantly, does it live up to the hype? The short answer to the second question is yes. The React has a character distinctly its own and is unlike any other foam we’ve run in. Nike equates the React with an overdose of softness in its promotional campaign, but that’s not an accurate description of the React. The React is undoubtedly soft but feels very ‘rubbery’ as opposed to sink-in soft. It provides an excellent damping sensation during longer runs without the mushiness. And based on our ownership experience, the React has proved to be durable as far as cushioning retention is concerned. The React feels rubbery because that’s exactly what it is. Nike says little on what the React is made of, except for a brief reference to synthetic rubber. After some sleuthing, it appears that the React’s primary ingredient is Styrene. To be specific, it’s SEBS (Styrene-Ethylene-Butylene-Styrene). There’s a detailed write-up at the end if you’re interested in learning more. We know that React vs. Boost is a topic for a heated debate. But React and Boost are so tangential in their chemical composition that it’s unfair to directly compare the React to Boost. That said, the React definitely seems to be a competitive response to the adidas Boost. From a performance viewpoint, the React scores over the Boost in a couple of areas. But then, the Boost outperforms the React in certain aspects, so both materials hold their own. We’ll cover these topics in our ride breakout. The way we see it, the React is an evolution of Lunarlon. Both are synthetic rubber based foams, and the React is a definite improvement over the decade-old Lunarlon. It remains to be seen what will happen to Lunarlon. 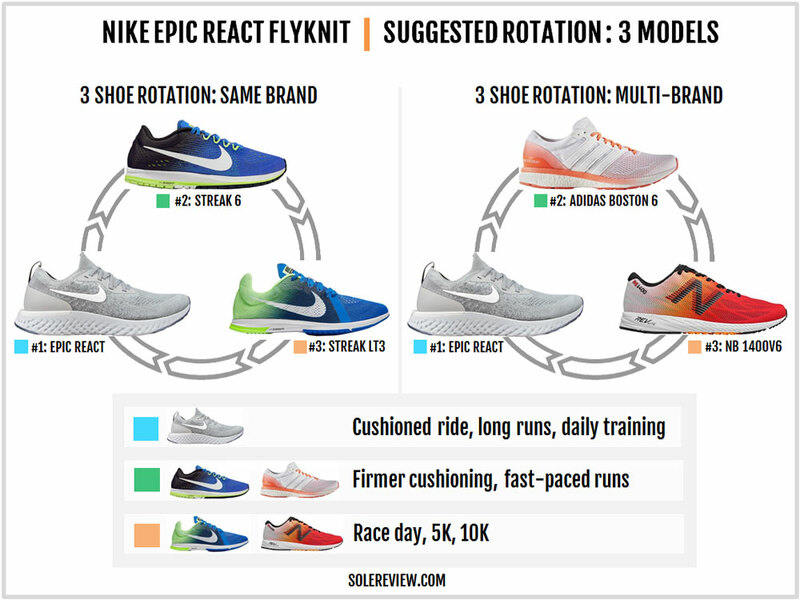 Given Nike’s recent foray into lower-priced (below $100) shoes, Lunarlon will likely be positioned as a second-tier cushioning tech with the React and ZoomX priced above it. Zoom Air will continue to make itself useful in staples such as the Pegasus and racing flats. Because while the React feels great in its cushioned-trainer form, we’re unsure of its performance in lower-profile shoes. The midsole design of the Epic React helps isolate its cushioning properties without interference. The midsole is full-length React; there is no foam lasting or a thick insole masking the ride experience. With the Epic, what you see is what you get. Nearly 100% of the cushioning is delivered by the midsole and there’s no blending of the insole softness with the midsole. The insole is a barely-there, wafer-thin kind. 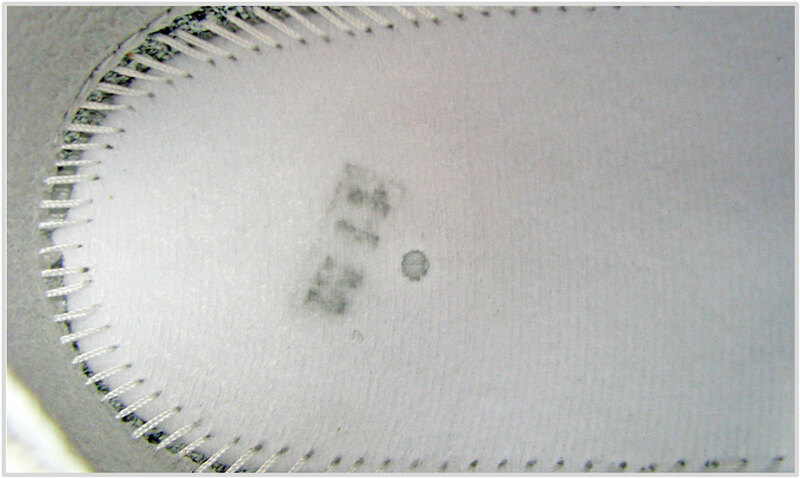 The lasting below the insole is a thin fabric which does not add cushioning. Even the outsole isn’t where it needs to be. The bottom uses rubber bits but they’re placed outside the rear-strike area and the forefoot transition zone. Regardless of Nike’s ‘computational design’ claims, the rubber lugs are ineffective when it comes to aiding traction or increasing durability. But look at the bright side. The React foam takes most of the brunt so we can judge the foam for what it truly is. 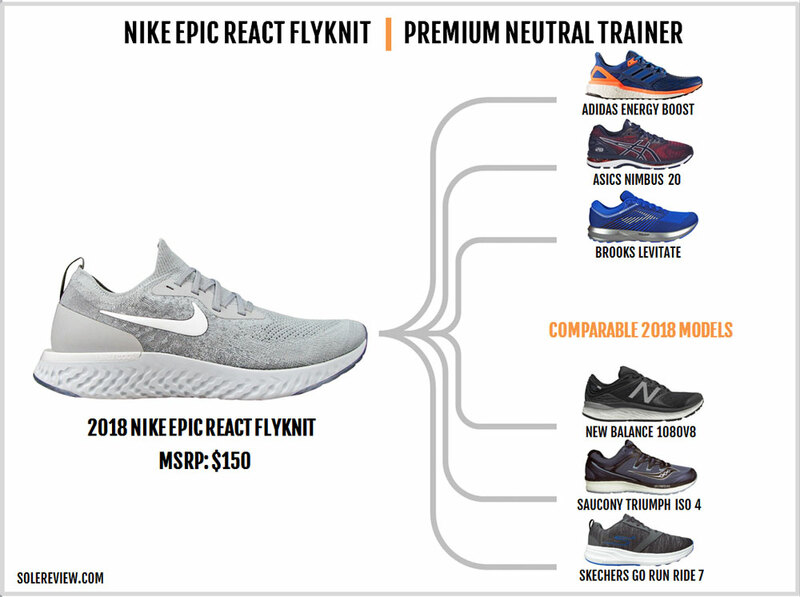 We’ve had the Epic React for over a month now and had the opportunity to subject it to a range of running conditions. Like any running shoe, the Epic React behaves differently based on its usage. But let’s begin by describing the general feel of the React midsole before diving into specifics use-cases. We know that React is neither EVA or Polyurethane (Boost, DNA AMP, Everun) but is a Styrene-based (synthetic rubber) material. And boy, does it feel rubbery. The midsole has a thick foam stack in the front and the back which makes it soft. And yet, this softness isn’t a sink-in or marshmallow-ey kind. The cushioning is dense and substantial and is noticeably more springy than traditional EVA foam midsoles. 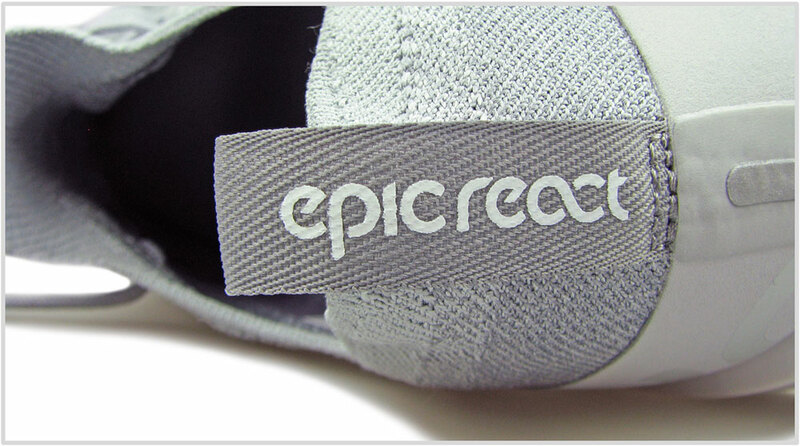 Not only is the Epic’s 10 mm drop midsole thick in the front and rear, it is also very wide. Both the forefoot and heel flare a full centimeter wider when compared to the Lunarepic. The additional midsole volume helps improve stability and the cushioning experience. The upper rearfoot has a plastic stabilizer which sits atop the midsole. This horseshoe-shaped clip prevents the heel from getting tossed around and works in concert with the midsole to deliver a very neutral experience. Unlike many neutral shoes, the midsole has no grooving to favor the lateral side. Both the sidewalls have an identical texture and are equally supportive. This helps center the weight and impart an extremely neutral character to the ride. The Epic React has a high volume rearfoot but works equally well for forefoot strikers. The lack of outsole rubber makes the forefoot feel padded, and the wide flare makes the base supportive. The forefoot is less responsive than the rear due to the lower stack. This brings up an interesting question – how will the React feel in a shoe with a low-profile midsole? Say, the Nike equivalent of a New Balance 1400? We don’t know yet. In its current avatar, the midsole has a nice rebound quality to it, though not in the league of Polyurethane-based midsoles such as AMP, Boost, and Everun. But this feeling diminishes in the thinner part of the React’s midsole, namely the forefoot. Don’t read this wrong; the React offers an excellent damping sensation throughout the midsole length. It’s just that the rebound isn’t as pronounced in the front as it is in the rear. All that said, the React is miles ahead of Lunarlon as a cushioning material. A direct comparison with the LunarEpic makes little sense because Lunarlon was present only as an insert with other materials around it. In the Lunarepic’s case, features like the outsole pods also contributed to the cushioning experience. As far as we know, the Lunarlaunch was the only shoe with a 100% Lunarlon midsole. When compared to the Lunarlaunch, the React’s advantage become obvious. The Lunarlaunch was softer and had the tendency to bottom out; the React does no such thing. The new foam is firmer (contrary to Nike’s claims) and more responsive than Lunarlon. And based on what we’ve seen (so far), it seems very likely that React will retain its cushioning longer than Lunarlon. For a shoe with a voluminous midsole, the transition quality is pretty good. While the Epic React is nowhere close to a ‘fast’ shoe, the weight loading happens in a smooth and no-sink manner. Also, one of the biggest reasons why the Epic doesn’t feel a chore to run in is its weight. Or rather, the lack of it. Even for a US 10, the Epic React weighs a mere 239 grams or 8.4 ounces – even a US 11 is just over 250 grams. That’s incredible for a shoe which has a high-stack, high-volume midsole. To put things in perspective, both the Nike Pegasus and Vomero weigh well over 10 ounces. Even the Lunarglide is nearly 10-ounces. The forefoot grip is decent on roads under normal temperatures. The grip might reduce during rains, but that has more to do with the low temperature than dampness. The React has a performance penalty under cold weather, and we’ll get to that in a bit. As pointed out before, most of the outsole rubber is placed outside the transition areas. Thus, the rubber slabs end up being mere showpieces with a graduated color effect. That was a general overview of the React’s ride character. And how does the React perform under specific running conditions? Let’s run through a few scenarios. Easy runs (10 min/mile or 6 min/km or slower): The Epic React shines under these conditions. The non-lethargic cushioning with a decent spring-back feel is ideal for those 10+ mile runs at an easy pace. The lightweight build of the React also helps make long runs effortless. Medium to fast-paced runs (7 min/mile or under 5 min/km or faster): Speed runs aren’t this shoe’s forte; there are better products from Nike for that. Due to the thick midsole, transitions do not happen quickly. There’s also a loss of stability during the quick touch and go. The bright side is that the midsole doesn’t bottom out during rapid foot strikes. Treadmill use: The ride experience is similar to road use except for a minor difference. At a pace of 5 min/km and faster, the forefoot might make a squeaking noise due to the friction with the belt. The React is made of synthetic rubber so it also squeaks on Vinyl and Linoleum flooring. Some readers have mentioned that the React makes a ‘clicking’ or popping noise but we haven’t heard any so far. Synthetic tracks: This is where the Epic React falters – even the Pegasus and Vomero feel better on tracks. And it’s not an outsole grip issue; the React midsole grips well on synthetic. Rather, it’s the midsole stack (sans rubber) and upper grip getting in the way of making the Epic a track trainer. The upper lacks the lock-down required for fast track workouts and the cushioned midsole doesn’t feel dialed in when turning into bends. The Epic React performs best under linear, road-running conditions. At temperatures below freezing: When we learned that the React was synthetic rubber, we knew that the review won’t be complete without subjecting the shoe to freezing cold. And why? That’s because normal rubber hardens in the snow. 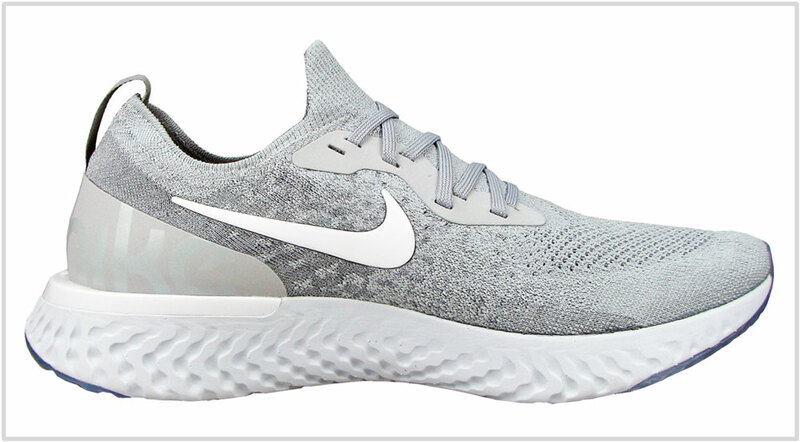 So we wondered – does the Epic React go through a similar change in its physical properties? It’s hard to find snow in May, so we put the Epic React inside the freezer compartment of a refrigerator. We kept it inside for an hour, because that’s how long an easy 10K will take under snowy or clear wind-chill conditions. The React loses most of its cushioning and responsiveness under freezing conditions. We didn’t have a durometer (hardness) gauge, but the midsole felt like a block of wood. The shoe felt super hard until the foam ‘thawed’ to room temperatures. 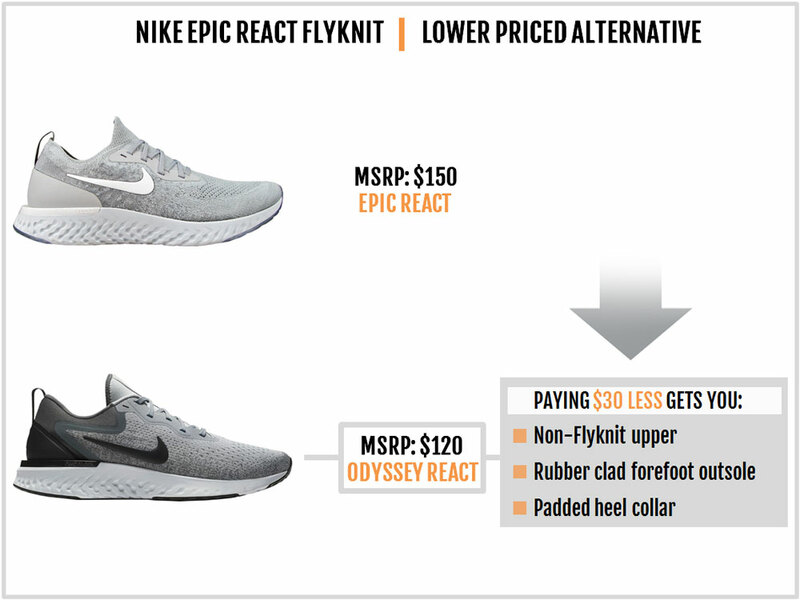 We do realize that real-world conditions will be more favorable for the Epic React. 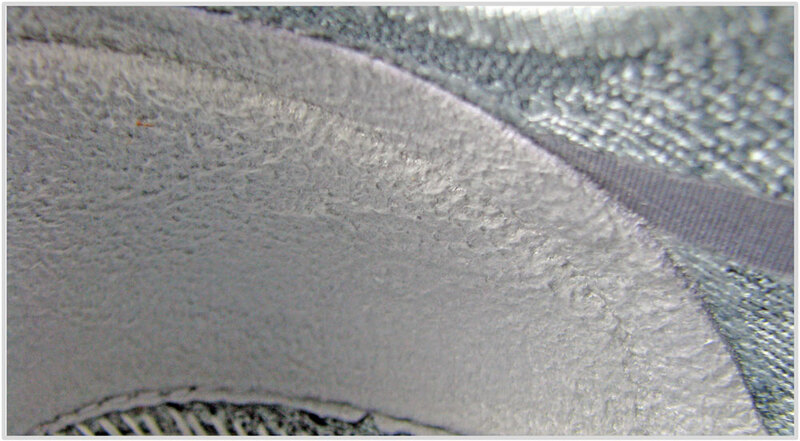 Unlike the freezer scenario, the midsole will be subjected to constant movement or friction during winter runs. Owing to the repeated compression and rebound, the React should not feel as stiff as it does in an inert state. But there’s no denying the fact that React does not like extreme cold. Needless to say, the Epic React isn’t ideal for winter use. This is the React’s only noteworthy drawback where it lags behind other foams including Nike’s own Cushlon+Zoom combo or the adidas Boost. The foam hardening will also lead to a decrease in outsole grip. 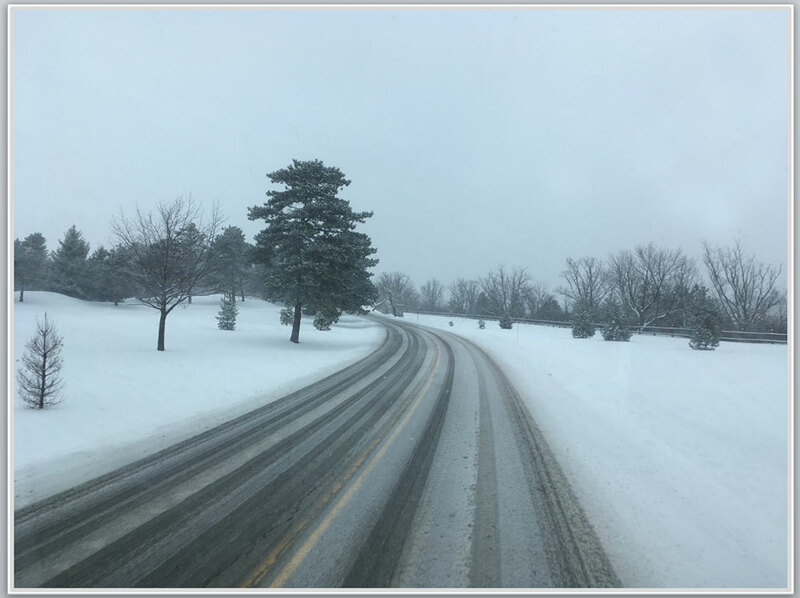 Think of this as the difference between summer and winter car tires. The React does not possess the all-season versatility to perform the role of both. Oh, by the way, we froze the Ultra Boost ST along with the Epic React for the same duration. The Boost midsole also stiffened, but not to the same extent as the React. You could still poke into the midsole and get some feedback. We believe that it is the material (Polyurethane) and the construction (air-filled globules) which give the Boost temperature superior resistance over the React. 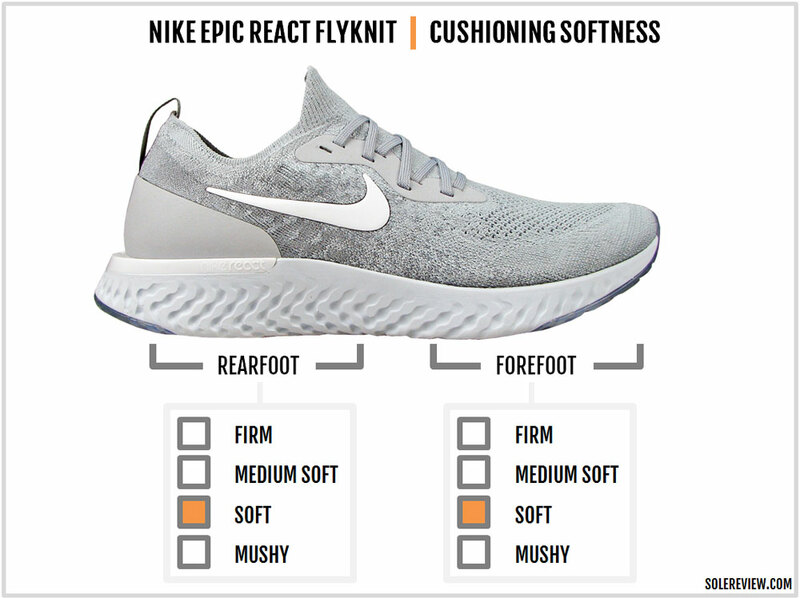 Which brings us to an oft-asked question – how does the React compare to other cushioning platforms? We were discussing Boost, so let’s lead with that. Allow us to offer you a hypothesis which lays down the key difference between the Boost and the React. We believe that the React foam is best experienced as a cushioned neutral trainer. We could be wrong, but we think that the React won’t feel as responsive when used in a racing shoe with a slim midsole. In short, the volume of React is directly proportional to the ride quality. The adidas Boost behaves the exact opposite. The more Boost there is in a midsole, the sloppier it feels. There could no better example than the difference between the older generation Supernova Glide and the new Supernova. The original Supernova had a lower profile Boost midsole with an optimal mix of cushioning, support, and responsiveness. The latest Supernova and the Energy Boost are soft but lack the liveliness of the Glide. The Boston Boost and the adios are two others examples of low-profile Boost excellence. In other words, the volume of Boost is inversely proportional to its real-world performance. The React has a huge lead over Boost in weight – that’s simply a non-contest. Aesthetic is a subjective area, but the React can be molded in different colors. Boost and Everun seem to be limited to white, though Saucony uses paint over the sidewalls. From a real-world usage perspective, Boost is more lively and responsive. As evident from the freeze test, it withstands colder temperatures better than the React. Saucony Everun is pretty similar to adidas Boost except for its increased firmness, so a similar comparison with React applies. The Brooks DNA AMP (used on the Levitate) is heavier than the React and performs better in colder conditions. That said, the DNA AMP doesn’t splay outwards like the React. The AMP is all about vertical compression due to its thick midsole skin. We’ll reserve our opinion on the ZoomX till the time we review the Pegasus Turbo. The original Nike Free Flyknit 4.0 has been, by far, the gold standard for the fit quality of Flyknit-based uppers. It had just the right balance of interior space and inherent stretch, and one could run barefoot in them without any irritation. Even today, it is solereview’s favorite shoe to do it all. So whenever a new Flyknit shoe is released into the wild, we benchmark it with the Free Flyknit. The Epic React’s upper doesn’t disappoint. For those with a regular foot width, the toe-box and the forefoot provide a comfortable fit without the aggressive squeeze. There isn’t any vertical margin above your toes, but the upper doesn’t pin the foot down. In general, Flyknit shoes have a snug fit compared to traditional engineered or spacer mesh uppers, so bear that in mind if the Epic happens to be your first Flyknit experience. To be more specific, the Epic’s forefoot is tighter over the small toe (lateral) side than the big-toe (medial) side. The toe-box slopes down shallow over the outer side all the way to the midfoot, thus making the front pointy. Even with the conforming fit, we suggest that true-to-size is the way to go. Buying a half-size larger results in the fit turning sloppy. Unfortunately, there are no additional widths available in the Epic React to remedy the paucity of space. 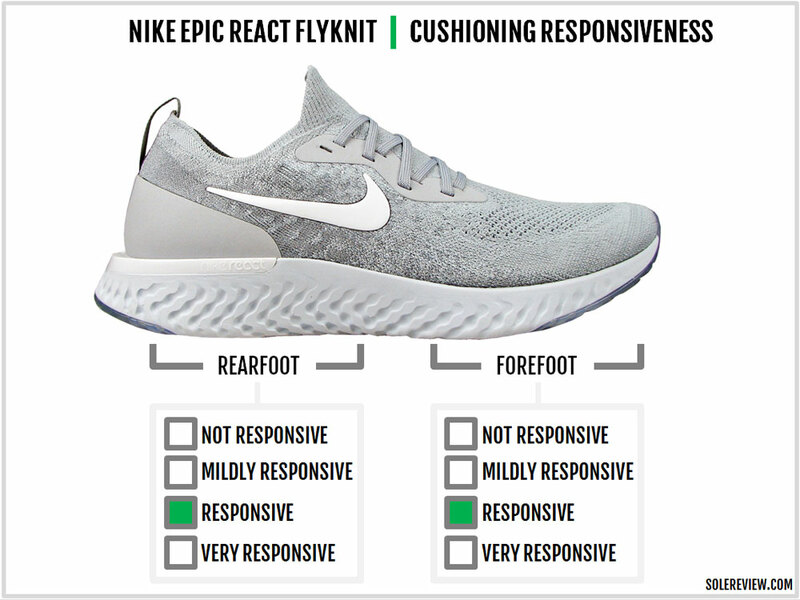 The Epic React’s Flyknit design differs than most Nike Flyknit uppers we’ve reviewed in the past. To begin with, the forefoot isn’t as elastic as some of past Flywire examples. The forefoot top has plenty of pores (which is good for ventilation) and can stretch a bit, but that’s about it. 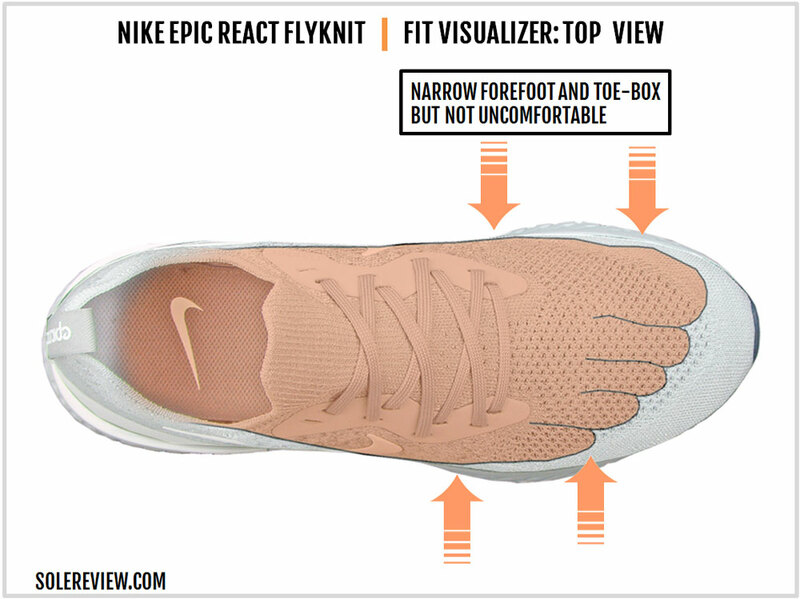 The other factor which sets the Epic apart from traditional Flyknit uppers is the liberal use of internal underlays. You can’t see it from the outside, but there’re no-sew Urethane layers supporting the midfoot and the lacing eyestay. 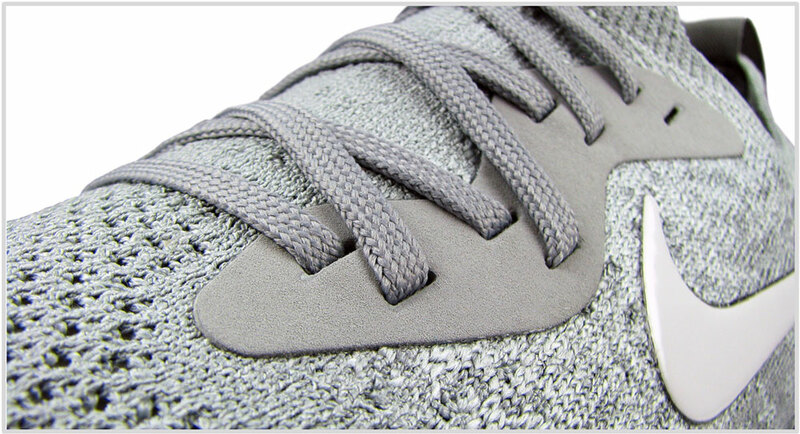 The laces pass through a synthetic eye-stay and an internal layer reinforces it. The reverse side of the Nike logos also has internal overlays which drastically reduce the elasticity of the midfoot sides. Compared to traditional Flyknit uppers, the Epic React feels stiff. At the same time, the tongue top is elastic. So if you want a relaxed midfoot fit you have to loosen the laces. This is important when you’re wearing the Epic for the first time. We recommend that you begin with a very relaxed lacing position and then dial up the pressure if necessary. Else the lacing prevents the elastic tongue from stretching over your foot. Cord-based Flywire was always a hit or a miss, so we’re glad to see the Epic ditch it. The new lacing system takes some work to get right, but the bright side is that there is no side pressure from Flywire. 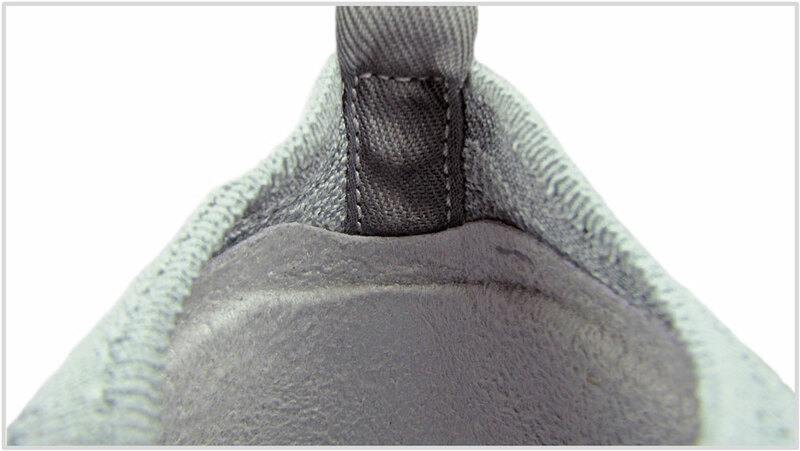 Also, the fused lacing panel is positioned away from the forefoot so it doesn’t bend/dig in during forefoot flexing. It requires some effort to get inside the Epic React. The tongue and heel collar are joined together in a true bootie fashion, so one needs to stretch the opening to slip on the shoe. So if you’re planning to use the Epic React as a casual, daily-use shoe, then we suggest that you explore alternatives. The collar edges are raw with no lining. There is a synthetic suede-like material lining the insides, and the heel pull loop is attached to it. 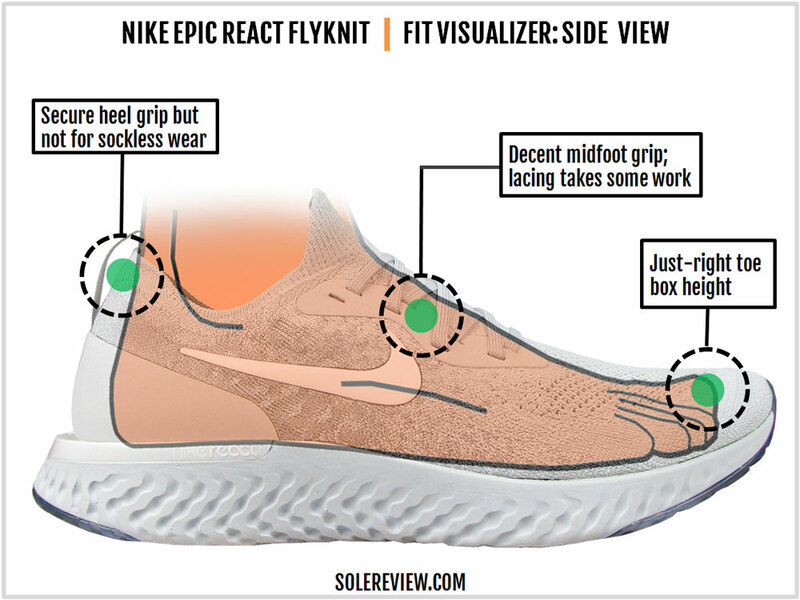 We’re always wary of heel loops curving inside (see the Lunarepic Flyknit), but in the React’s case, the loop is very thin and soft. When worn with socks, the loop isn’t a bother at all. It doesn’t irritate with sock-less use either, but you do sense the bumps, layering, and the collar edges over the bare skin. We don’t recommend running barefoot in the Epic React. The heel doesn’t have an internal counter but isn’t collapsible. The internal suede and the outer overlay combine to add structural rigidity. The heel also rests on a plastic stabilizer which wraps around the rearfoot in a horseshoe shape. We covered its function in our ride experience section, so you know what it’s there for. We’ll leave the Flyknit upper out of this discussion. 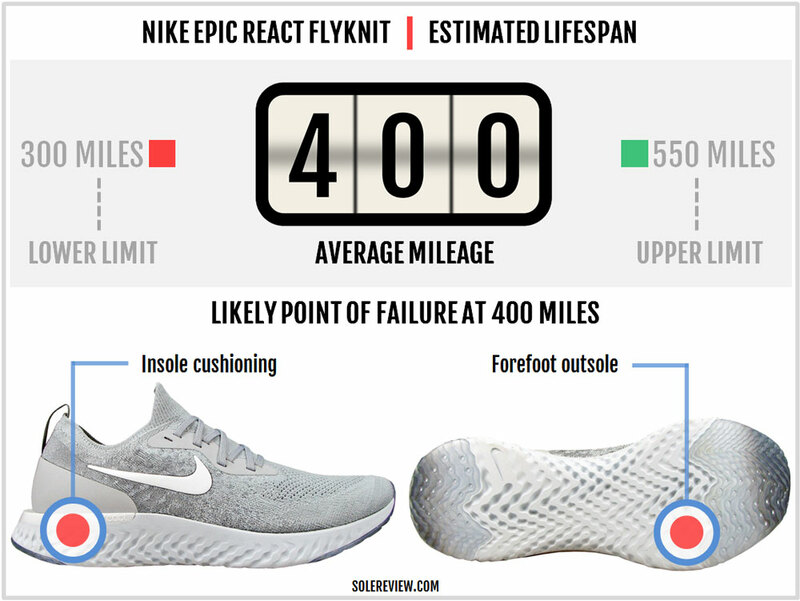 We’ve rarely encountered a Flyknit upper failure and it’s highly unlikely that you’ll face a problem with the Epic React. That leaves us with the midsole which also doubles as the outsole. 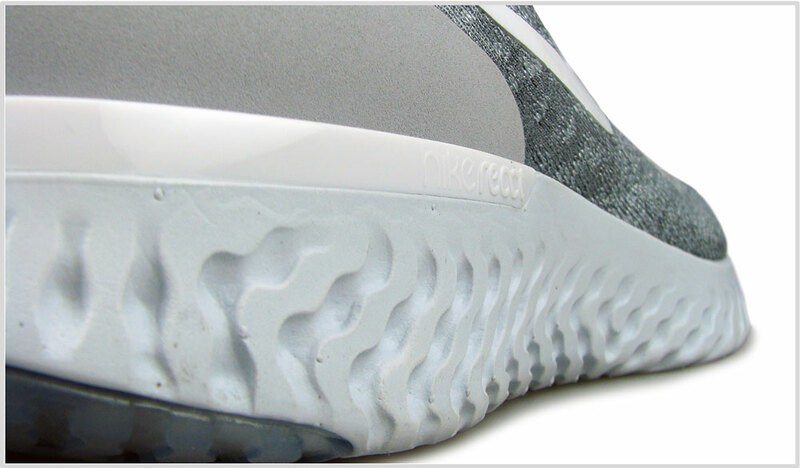 The early and visible wear on the exposed foam outsole is the common complaint, and this is a valid feedback. You’ll see early signs of foam wear over the inner forefoot and the outer rearfoot. But in the Epic React’s case, the ‘perceived’ wear and tear is much higher than the actual wear. This is because of the outsole’s rather unusual design. 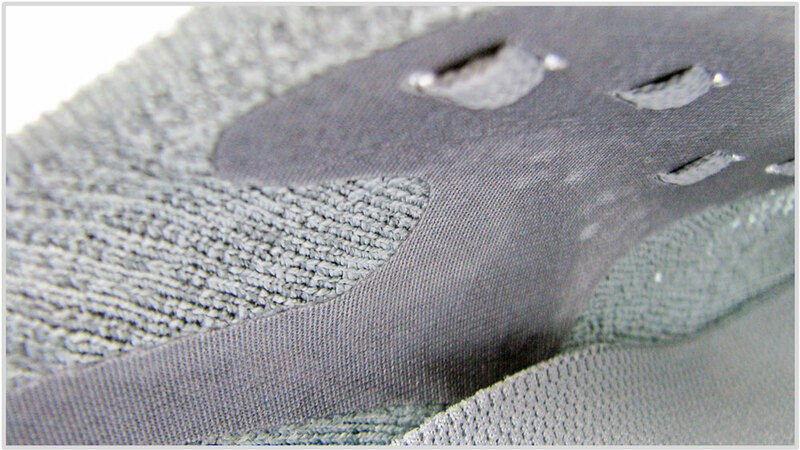 Even on a brand new pair, the edges of the outsole have a ‘pre-worn’ texture. 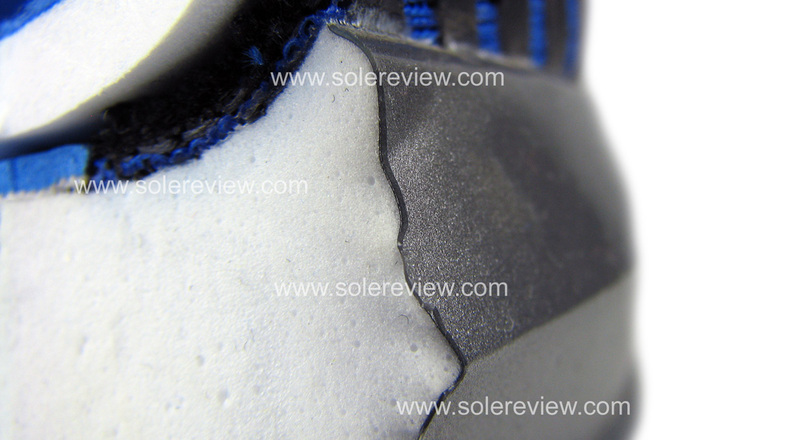 If you examine the outsole, you’ll see that the textures near the edges are smooth, almost flat. So when the cosmetic wear happens after 20 miles or so, the outsole appears to have shed a lot of foam. That’s not the case – it just looks worse than it is. The outsole was already ‘bald’ in some areas to begin with. There’s no denying that the foam undergoes wear and scuffing. But once past the initial stage, the rate of wear slows down. Nonetheless, Nike’s placement of rubber is puzzling, to say the least. The coverage in the front is useless from a wear-protection perspective; it’s good as not having any rubber at all. At the time of writing this review, we have close to 70 miles on the Epic React. There has been absolutely no decrease in the cushioning level. This augurs well for long-term durability and the React should give you over 400 miles of trouble-free cushioning. Under summer-time running conditions, the React foam is the real deal. The Epic’s ride has a super lightweight, cushioned, smooth, and responsive quality. Additional design features like the flared heel and forefoot make the Epic React supportive. Nike has done a good job with the Epic’s Flyknit upper. The upper is snug but without the constricting feel. Leaving out Flywire means that the midfoot wraps smoothly without the side pressure. While the list of positives definitely outweighs the negatives, there is scope for improvement here. 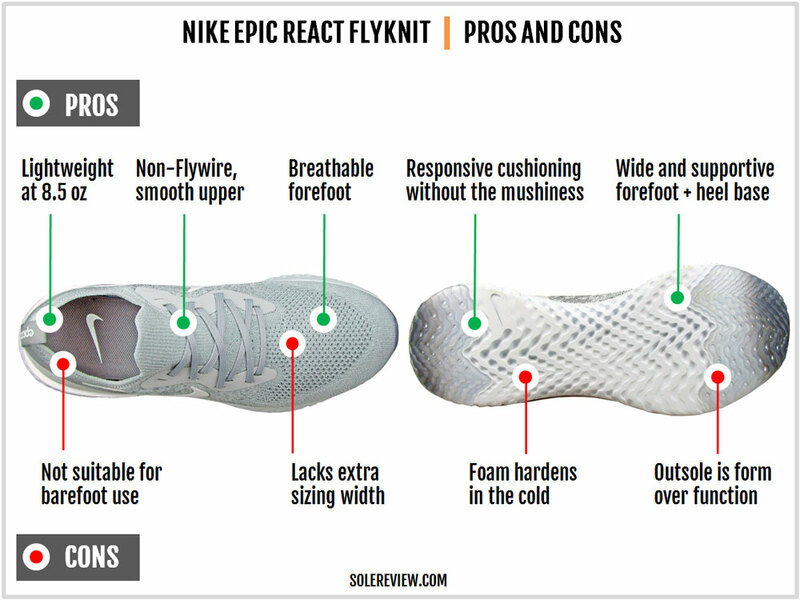 The Flyknit upper isn’t barefoot-use friendly. In what’s an example of poor design, the heel strap curves inside and there’s also a bump where the soft inner suede meets the Flyknit fabric. While this is nowhere as bad as the Lunarepic Hi, barefoot use is best avoided. With socks, the Epic’s heel loop becomes a non-issue. Nike and adidas have seldom excelled in offering additional widths, and that remains the case with the Epic’s single-width availability. 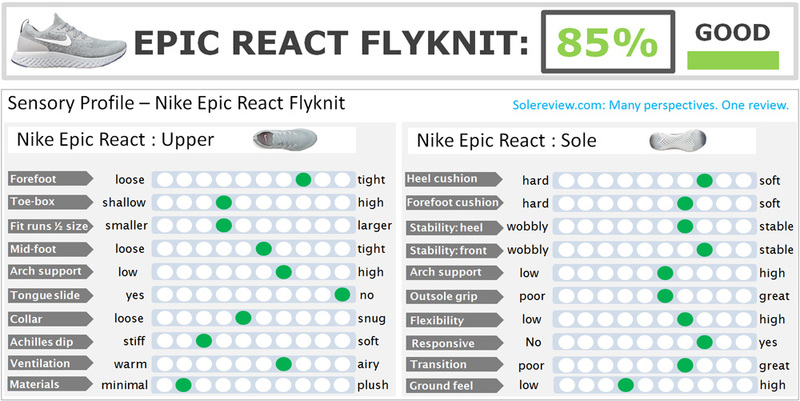 So if you find the Flyknit fit unsuitable for your foot type, there’s no fallback. And lastly, what’s with the strange placement of outsole rubber? The translucent rubber slabs aren’t functional at all. The areas which undergo the most wear and tear are left exposed while the low-wear zones have decorative pieces of rubber. Nike should have left the outsole rubber out entirely to make the Epic even lighter. The React foam has a major shortcoming. It ‘reacts’ adversely to freezing temperatures with the midsole turning into a wooden block. So if you plan to run in the snowy winters, React-based running shoes will not provide the summer-friendly cushioning. Nike recently released the Odyssey React, a lower-priced React variant. Unlike the more expensive model, the Odyssey doesn’t have a Flyknit upper. The Odyssey’s upper is made of engineered mesh, which means the interiors are smoother-fitting than the Epic. Not everyone is a fan of Flyknit upper which makes the Odyssey a value-for-money substitute. The Odyssey uses a conventional, foam-backed collar which makes the rear upper more comfortable than the Epic. The midsole is full-length React foam. The forefoot is firmer in the front than the Epic due to the outsole coverage. Instead of leaving the forefoot exposed, the Odyssey covers the foam with twin rubber slabs. To sum up, the Odyssey will do everything that the Epic can. It’s a cushioned trainer meant for the long and easy runs, just at a lower price tag. Cushioned as the Epic React is, it isn’t the best shoe for fast training runs or short races. In its current avatar, the Epic React excels as a long-distance workhorse. Thus you need to pair the Epic with something faster for those speed days. The Nike running shoe line is undergoing an overhaul. The introduction of React and ZoomX foam will likely push Lunarlon-based shoes to lower price rungs. As a result of this transition, there are currently gaps in Nike’s assortment. For example, there’s no shoe which bridges the chasm between regular trainers and race-day shoes. In the past, the Lunaracer and the Lunartempo provided hyper-light cushioning without the punishing flatness of racing shoes. Under the circumstances, an ideal 3-shoe rotation which includes the Epic React doesn’t exist – yet. We’d recommend pairing the Epic React with either the Zoom Streak 6 or the Streak LT3. If you want both, go for it with the knowledge that there’s a narrow gap between the regular and LT Streak versions. On the other hand, exploring options outside Nike yields plenty of rotational companions. Our pick is the adidas Boston 6 (the 7 has just been released), a firmer shoe which feels faster than the Epic. The Boston 6 outweighs the Epic, but you get superior outsole grip and a speedier ride. The New Balance 1400 is our perennial racing shoe pick. The 1400V6 comes has a lively ride and a comfortable upper available in multiple widths. At a mere 8.4 ounces, the Nike Epic React is, by far, the lightest of its kind. That makes comparisons hard with incumbents in the premium neutral cushioning category. That’s the reason why we included the Skechers Go Run Ride 7 here. Though it costs considerably less (-$60) than the Epic React, the Ride 7 weighs below 10 ounces and has a highly cushioned ride. The midsole is firmer than the Epic React. Sure, the Ride 7 doesn’t have a stretch knit upper or a rubbery midsole. But its $90 retail price makes it exceptional value for the cushioned ride it provides. The GRR7’s upper has a more relaxed fit than the Epic. The adidas Energy Boost has the soft Boost cushioning underfoot. But it’s a shoe better suited for rearfoot strikers since most of the Boost is loaded at the back. It is significantly heavier than the Epic React too. If adidas Boost is too soft for your taste, try the Saucony Triumph ISO 4. The Everun midsole is made of a similar material as the Boost, except that the ride is firmer. The Brooks Levitate is another neutral trainer which uses Polyurethane for its midsole. That’s where the similarity ends. Instead of fusing foam globules, the Brooks AMP covers the single-density midsole with a TPU skin. This gives the ride its distinctive ‘vertical rebound’ quality. Given the company it keeps, there isn’t much going for the New Balance 1080V8. The regular EVA midsole does its job, which is to provide a cushioned base to do long runs in. The 1080 makes a case for itself as a comfortable shoe available in a number of widths, but that’s all there is to it. The Asics Nimbus 20 has a plush upper with a medium-soft ride. The Flytefoam midsole makes the Nimbus firmer than past versions but a lot lighter. The Nimbus has little in common with the Nike React except for the price-band it resides in. BONUS SECTION: WHAT IS THE REACT FOAM MADE OF? Wait. What? Are you still here? Well, good on you; here’s some bonus content. There is sparse information available on what the React foam is really made of, except for a reference to ‘synthetic rubber’ in Nike’s marketing materials. 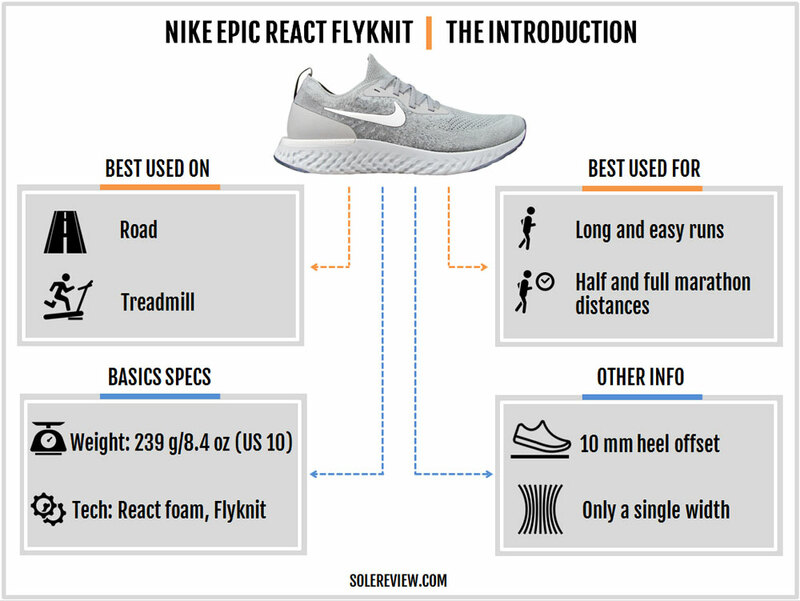 Solereview takes an educated guess at what the Epic React’s formulation. Our estimate is based on many hours of trawling through Nike’s public patent archives. When Nike refers to ‘synthetic rubber,’ it means that it is only one of the midsole’s many ingredients. And that’s true for all foam midsoles, regardless of whether the main ingredient is EVA, PU, or any other elastic material. And why are midsole formulations so complex? 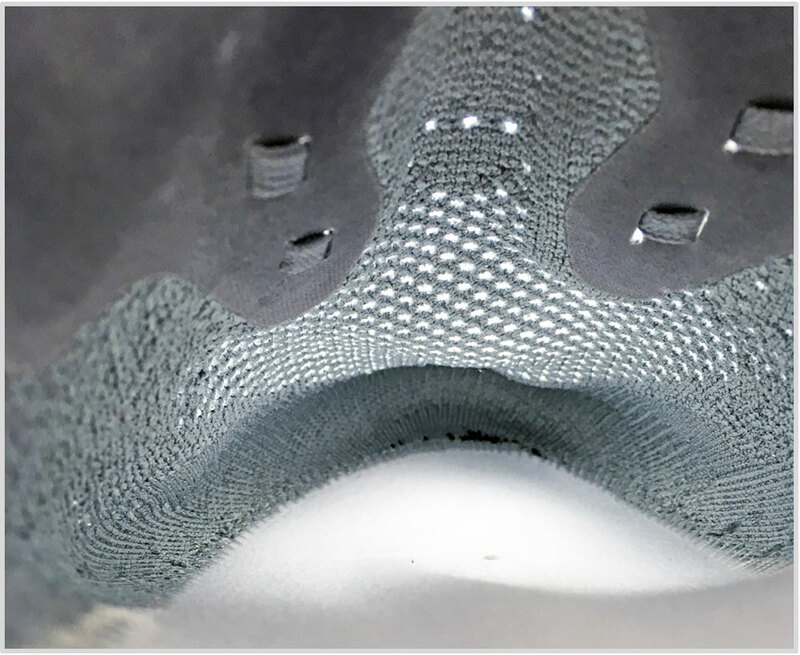 If the goal of a midsole foam is to achieve widespread commercial success, then many conditions must be met. The foam should be cushioned without feeling mushy. The midsole should be durable and not flatten after a few hundred miles. It should also be lightweight, grip well, and be resistant to temperature changes. And given the high sensory standards of running shoes nowadays, the ride must also be responsive or springy. Needless to say, it is impossible for all these characteristics to co-exist if there’s only a single ingredient involved. The versatility of a performance footwear foam can be judged based on three broad parameters. Responsiveness: This is the ‘bounciness’ or rebound property of a midsole. Technicians use the terms ‘Energy return’ or ‘damping,’ and this is determined by dropping a piece of metal over the foam and measuring the rebound. Ride responsiveness in real-life will depend on several other factors, but when comparing two or more foams in lab conditions, the damping test is the best way to do it. Cushioning: The softness or the hardness of a midsole is measured by an ‘Asker C’ durometer. A common version of this is a handheld gauge; a small protrusion extends out of it and presses into the foam. Hardness is measured by how resistant (or not) the foam is when this gauge is pressed over it. A ‘cold-stiffening’ test is also conducted to measure the material’s resistance to temperature. Durability: When people think of midsole durability, loss of cushioning or flattening is the first thing which comes to the mind. This is usually measured by lab tests called compression set, tension set, creep, stress relaxation, and elongation-at-break. But there’s more to what meets the eye. 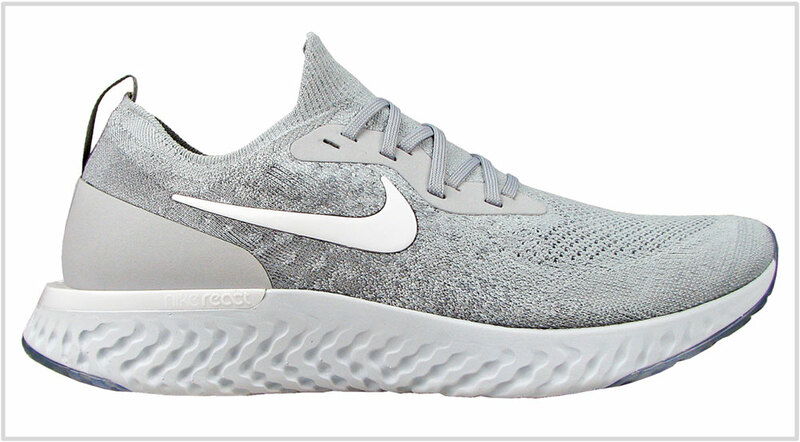 For example, if a midsole is not protected by a separate outsole – the Epic React for example – then the material needs to be abrasion resistant. Also, the midsole should withstand adverse reactions when it comes in contact with other chemicals. Also, foams usually tend to degrade over time and through exposure to sunlight. If the various patents are anything to go by, Nike’s approach was to find a foam solution which balances responsiveness, cushioning, low weight, durability, and the ability to infuse color into the foam. The last part is important; E-TPU foams like the Boost and Everun are currently available only in white. The Nike React foam’s exact formulation is unknown. That said, it appears extremely likely that the React foam is a combination of SEBS (Styrene-Ethylene-Butylene-Styrene) and a second and/or third copolymer along with a number of other ingredients required to manufacture a midsole. The Epic React is also likely to have undergone an injection molding process followed by compression molding. In short, the hero ingredient of the React foam is a Styrene based compound. And how exactly did we arrive at these findings? 1. All these patents have Mr. Hossein Baghdadi listed as the inventor. He also appears in the Nike Epic React promo video. 2. The formulation of the midsole involves the use of SEBS polymers. The Epic React’s marketing materials refer to the use of ‘Synthetic Rubber’, which is a generic description of the latter. 3. The test results focus on areas like Energy Return which happens to be one of the Epic React’s highlights. 4. The patent filing dates appear consistent with the React’s launch timeline. It’s noteworthy that Nike’s blend of materials is proprietary; the individual ingredients are not. Based on the patents, it can be assumed that the following suppliers provide some of the main compounds. 1. Synthetic Rubber: Tuftec® SEBS Copolymer from the Japanese company Asahi Kasei OR Kraton® G1651 from Kraton Corporation. 2. Olefinic Copolymer: Infuse® or Engage® Copolymer from Dow Chemicals. Materials like the Tafmer linking polymer from Mitsui Chemical are also potential ingredients of the React Foam, blended along with other processing agents. 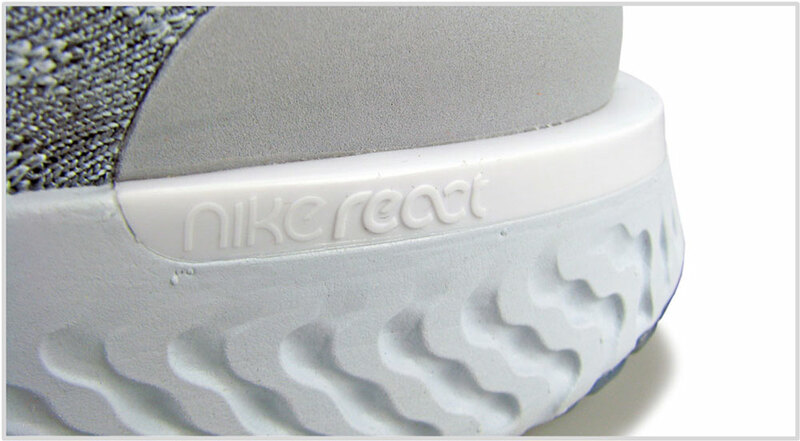 To cut a long story short, the primary ingredient of Nike’s React Foam is Styrene, a synthetic rubber. This is why the Epic React rides the way it does – rubbery without being overly soft or mushy. The Styrene composition also bodes well for long-term cushioning durability and wear-resistance.